GBPUSD’s upside movement from 1.3039 extended to as high as 1.3279. Further rise to test 1.3337 key resistance is still possible in the coming days. As long as this level holds, the sideways movement in a range between 1.3027 and 1.3337 could be treated as consolidation of the downtrend from 1.3657 (Sep 20 high), and another fall towards 1,2774 support is still possible after the consolidation. Near term support is at the rising trend line on the 4-hour chart, a breakdown below the trend line could bring price back to next support level at 1.3130. Below this level will confirm that the short term uptrend from 1.3039 is complete, then next target would be at 1.3027, followed by 1.2900. 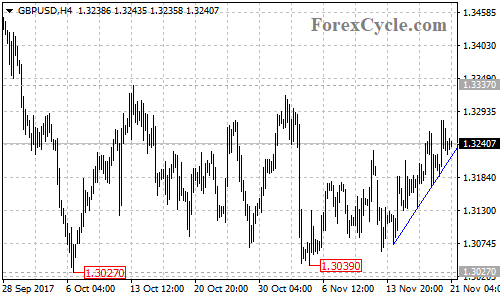 On the upside, a breakout of 1.3337 resistance will suggest that lengthier correction for the downtrend from 1.3657 is underway, and this could trigger further upside movement towards 1.3470.